The concert hall at the Sydney Opera House holds 2,700 people. This blog was viewed about 25,000 times in 2014. If it were a concert at Sydney Opera House, it would take about 9 sold-out performances for that many people to see it. THE WIPM GOING INTO 45! The WIPM Party going into 45. The W.I.P.M. put a lot of horsepower into the economy of Saba to bring our island to where it is today, and once re-elected in 2015 will have its history as a continued guarantee for good governance. 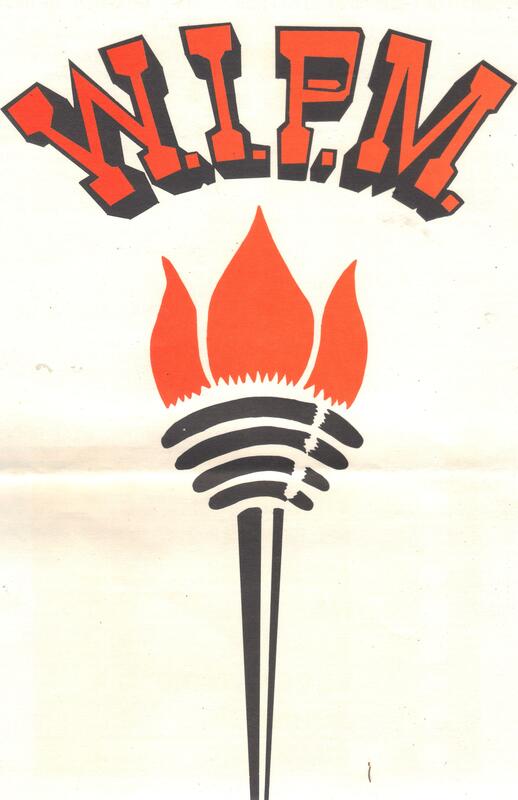 On November 24th 1970 the branch of the WIPM party on Saba issued a press release to announce the formation of the party on Saba. The announcement gave the names of the establishment of the Party which was to bring prosperity to Saba and change the face of the island for generations to come. 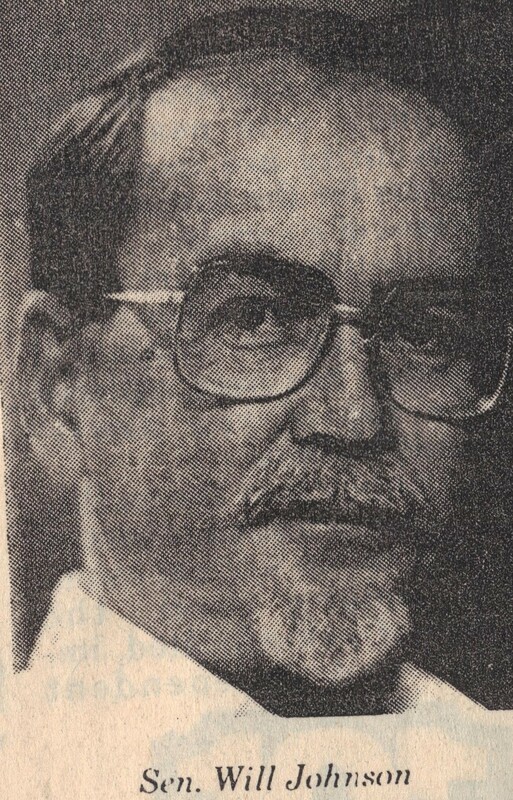 Island Councilmember John Godfrey Woods, Vice President. Island Councilmember Peter Lycester Granger, Treasurer. Mr. Calvin Roland Holm, Board member. Mr. Edison Melvin Peterson, Secretary. Over the years the WIPM party has changed leadership but has remained faithful to its founding principles and will continue on that path of stability in government which benefits all who live on Saba. 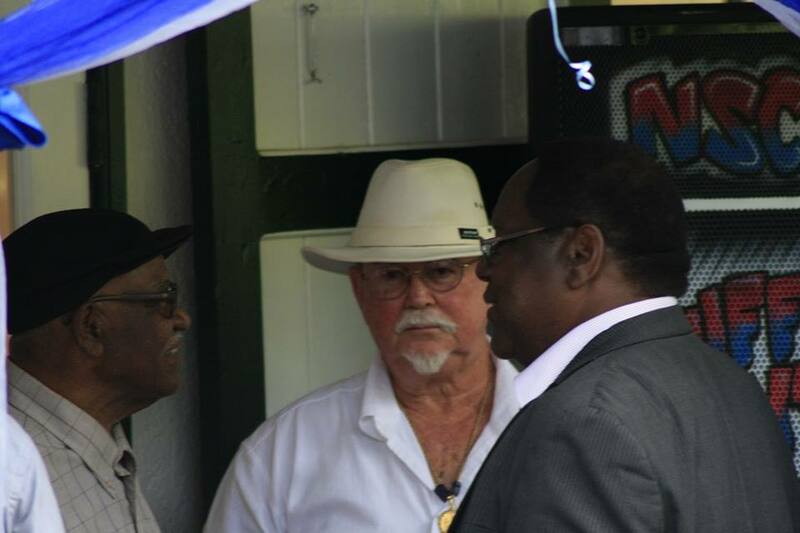 Pictured here standing left to right: Commissioner Chris Johnson, Island Council Member Eviton Heyliger, Commissioner Bruce Zagers, Member Norman Winfield, Island Council Member Carl Buncamper. Seated Mrs. Amelia Nicholson-Linzey, Island Council Member, Roland Wilson, Party Leader and Island Council Member, Roy Smith former State Secretary etc. and Will Johnson, party Chairman since 1970. 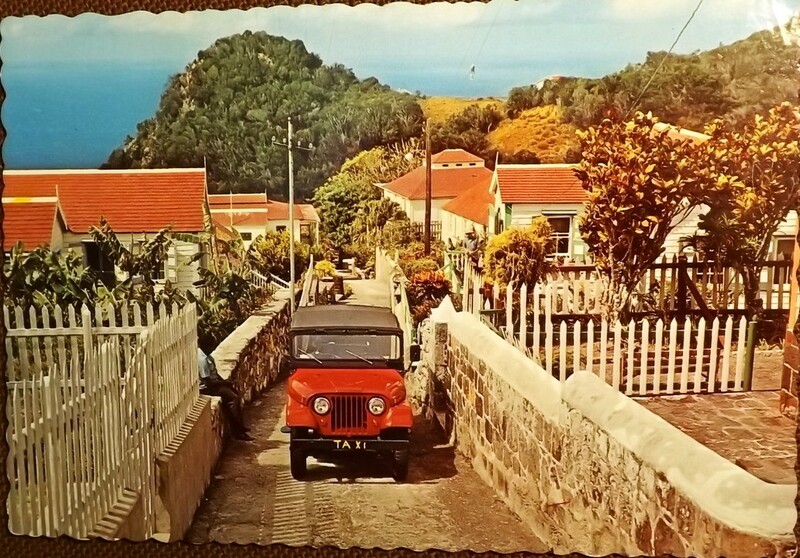 This announcement made quite a commotion especially on St. Maarten as even before an election took place in 1971 the WIPM had two seats on the 15 Member Island Council from Saba. Furthermore early 1971 the Hon. Eugenius Achilles Johnson was appointed Administrator. The next in line to claim his open seat on the Island Council was Mr. Calvin Roland Holm, and we made an immediate effort to have him moved into the Island Council so that WIPM then had a majority in the Council even before the elections. We did not do anything to remove the Commissioners and even after the elections we cooperated with them to let certain decisions remain in favour of their party. We took the road less travelled up to then and did not go out for revenge. 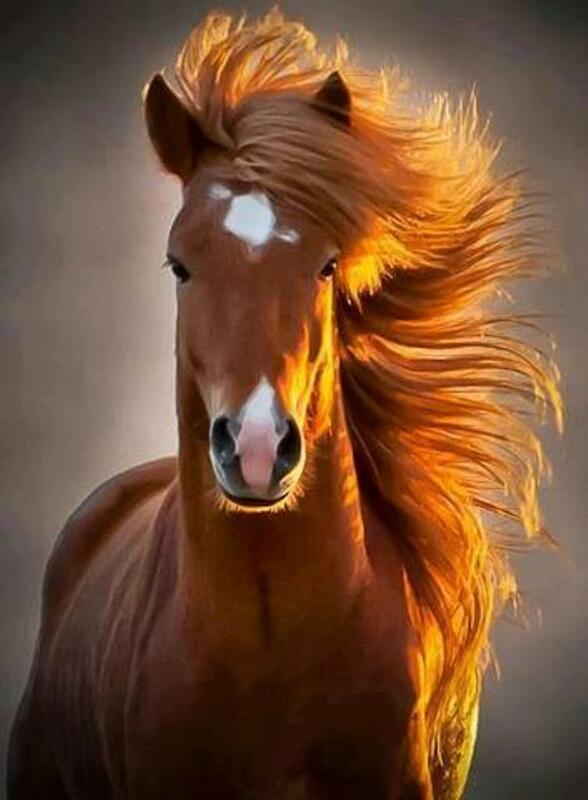 A new wind was blowing in Saba politics. An enlightened administration, of which the sole goal was to bring prosperity to the people of Saba and the WIPM has done that. Over the years I have filled many functions from Island Council Member, elected 8 times, Commissioner elected five times, Senator (16 years), Administrator and Act. Lt Gover (17 years). Some of these functions were combined. The WIPM torch has been proudly carried into battle in every election since 1971 with the exception when we boycotted successfully two elections in order for Saba to get representation in Parliament and we were successful. 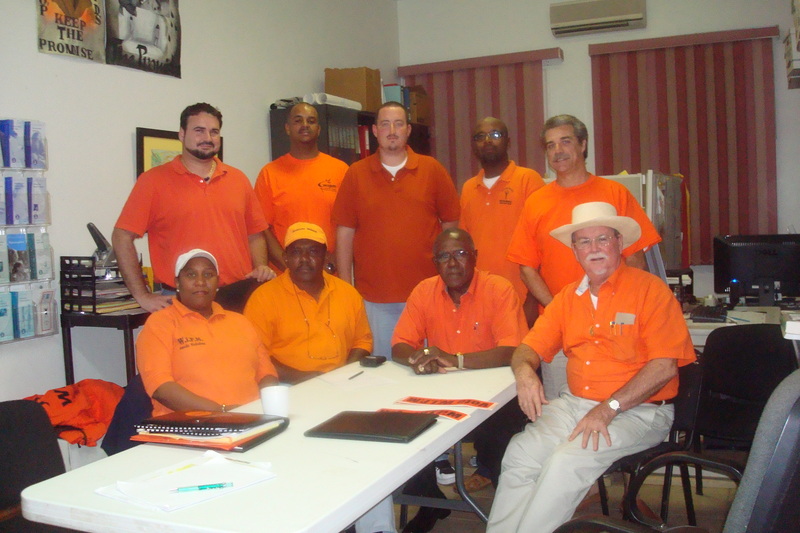 The colour Orange was chosen by Mr. Jocelyn Arndell when the party was running on all three Dutch Windward Islands. 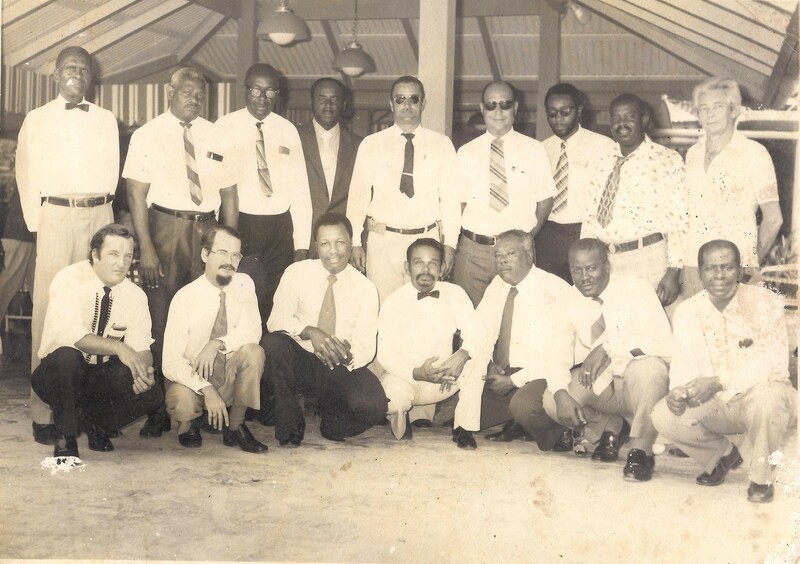 Some of the Members of WIPM who ran in the 1971 Island Council elections . In back from left to right. 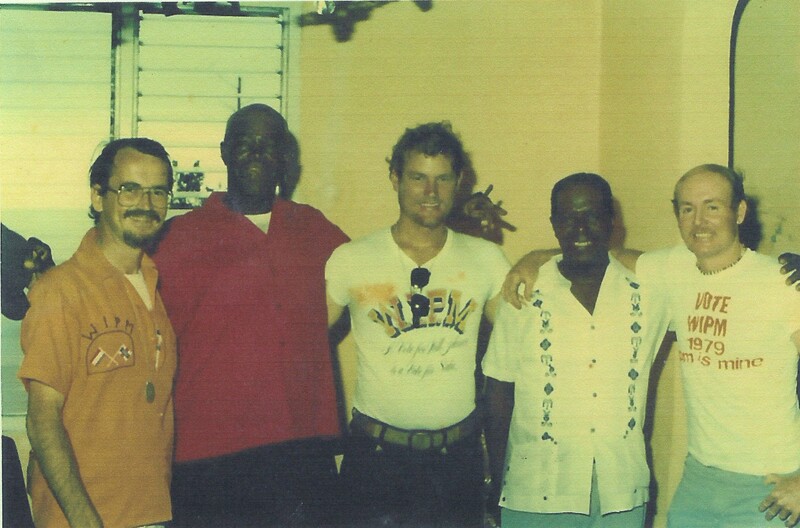 Mr. Ellis Zagers, Supporter Minister Leo Chance, Kenneth Peterson, John G. Woods, Eddy Peterson. In front left to right. Alex Heyliger, Leonard Hassell, Will Johnson, Calvin Holm and Peter Granger, and also on the list at that time was Stevanis Heyliger. “Last week Friday we had a party for Raymond Johnson for his 77th birthday. When I told Cessie Granger that I had been to the top of the mountain he said: “Man you should have let me know I would have gone with you!” Cessie is 93. That type of optimism is typical of the WIPM party and defines the party along with consistency in keeping the name of the party, our party colours and trying to always get people to run on our ticket who can run a government. It is one thing to run for office but quite another story when it comes to running a government. Our experience has been that on the date of postulation of candidates people see whose running for office and make up their minds already which party can run a government. July 2nd, 1975. Just elected by the Island Council, Commissioner Will Johnson with next to him Island Council Member Calvin Holm, addresses the Territorial Council in the Court Hall of St. Martin, a building very familiar to him where he started working in 1960 in the Post office, Receivers Officer, and worked at time for the Notary, the Curacao Bank etc. While at 45 the WIPM may seem old, it is a young party. Young in the sense, that over the years the party has renewed its leadership according to circumstances. In October 1970 a press release was issued by me, by the late Calvin Holm and by Eddie Peterson informing the people that we had formed the WIPM party. A month later then Island Council members Cessie Granger and John Godfrey Woods joined us and so WIPM already had representation on the Island Council of the Windward Islands in November 1970, forty years ago. The WIPM party has taken the people of Saba from the days of coal pits to gas stove and beyond. A party willing to work for you again once elected in 2015. You will continue to be in good hands if you vote WIPM. 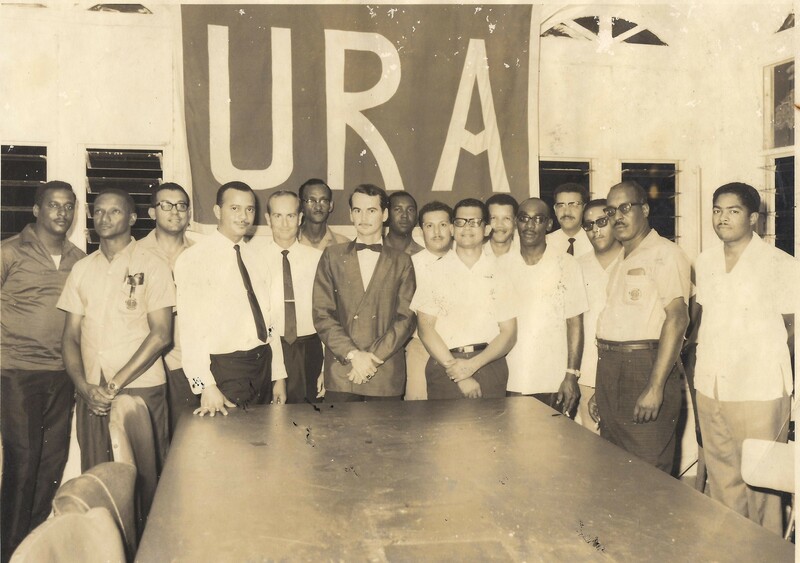 The roots of the WIPM party go back to 1962 when I started out in politics, and when Claude Wathey sent me here from St. Maarten to campaign for him. I had no instructions and so I decided to support Mr. Van Hugh Hassell, who was the godfather of my brother Freddie. 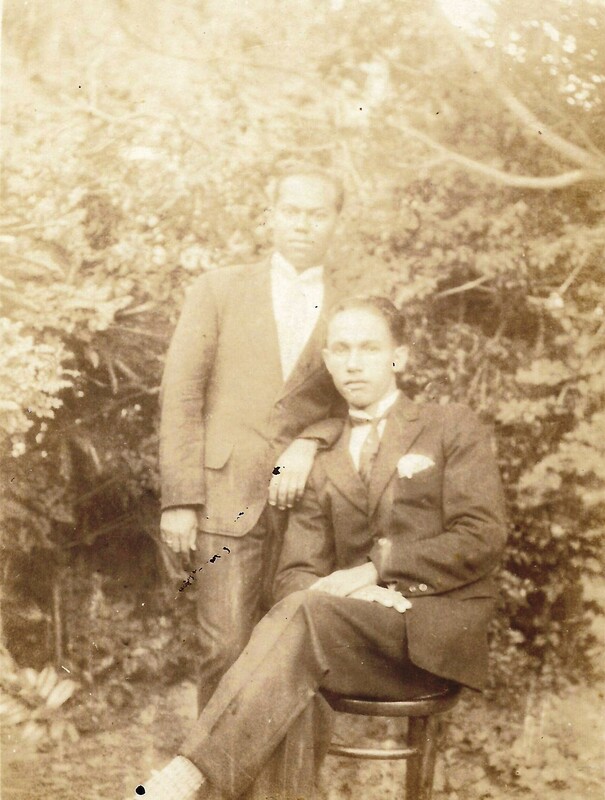 Van Hugh was the first man of colour to become a civil servant in the Windward Islands. Wim Lampe then Lt. Governor was married to his sister Lena Vanterpool. Van Hugh’s mother was a sister of the late Mr.Gardy Hassell. When the elections were over Van Hugh had 152 votes on Saba and Wathey had 11. Wathey won by 142 votes and never forgave me for supporting Van Hugh. Van Hugh Hassell, seated, with Dr. Berkenveld standing. December 2nd, 1930. He was the godfather of my brother Freddie and so in 1962 I supported him on the DP ticket. He was a man of great principles. In 1967 there were no elections. I travelled with Mr. Wathey to Saba to help engineer a combined list as well as to Statia. I decided in 1969 to oppose Mr. Wathey for Senator, and I pulled 626 votes on the three islands. 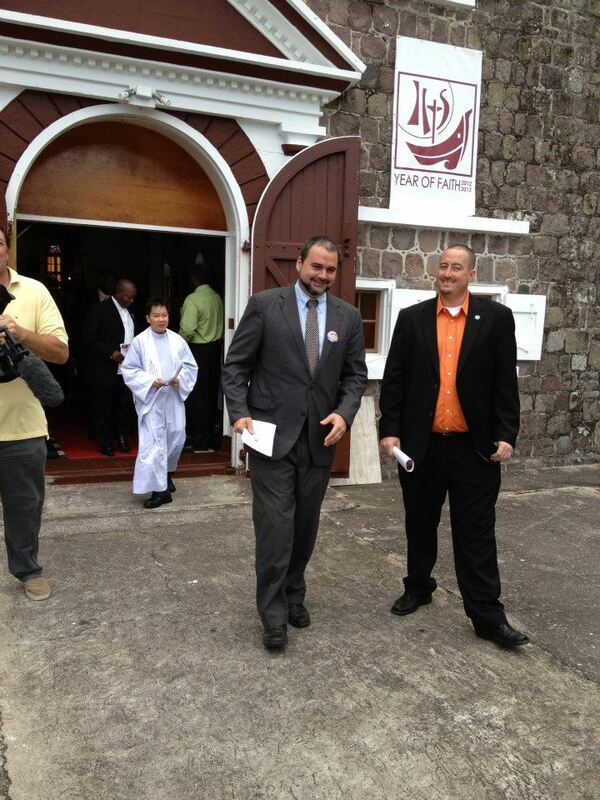 In that election the people of St. Eustatius campaigned for me on all three islands. People like Mrs. Christine Flanders (aunt of Lady Alida Francis) Harold Berkel and the entire Berkel family, Bengie Schmidt and the entire Schmidt family, Leonard Sprott and the brothers John and Max Suarez, and not to forget my friend Laura Rouse and her children. Standing tall in every sense of the word and doing a good job for all of Saba since 2007 pictured here: Commissioner Bruce Zagers right and Commissioner Chris Johnson left. Both college educated and able and capable to continue to represent you in a professional manner! Under difficult circumstances they have worked very well together, all for one and one for all. When Claude went up by Hunter House, he would preach to Eddie and Allan that their friend Will would land them in jail and they would not even know what for as my name only appeared as founder of the paper. Back then I made fls. 192.50 Per month, an after paying room and board I had fls. 27.50 left over. Looking back on those days I can tell you that that fls.27.50 went far. In 1971 the WIPM party won on Saba and St. Eustatius and had two of the five seats on St. Maarten. I was not allowed to hold office for four years, while others have held office being in closer family relationship than I was. The Lt. Governor had been married to my sister Sadie. She died young and he remarried, and though elected by the people I was told that I would be denied the office as Article 11 of the Island regulations forbade two family members from holding office at the same time. I fought it with everything I had to no avail and had to go through a long struggle and take down lies to get people to vote for me once again. I leave that part to history for now. The WIPM party was born out of the URA party. In 1969 against all odds I decided to oppose Senator Claude Wathey for the Senate seat of the three Dutch Windward Islands. 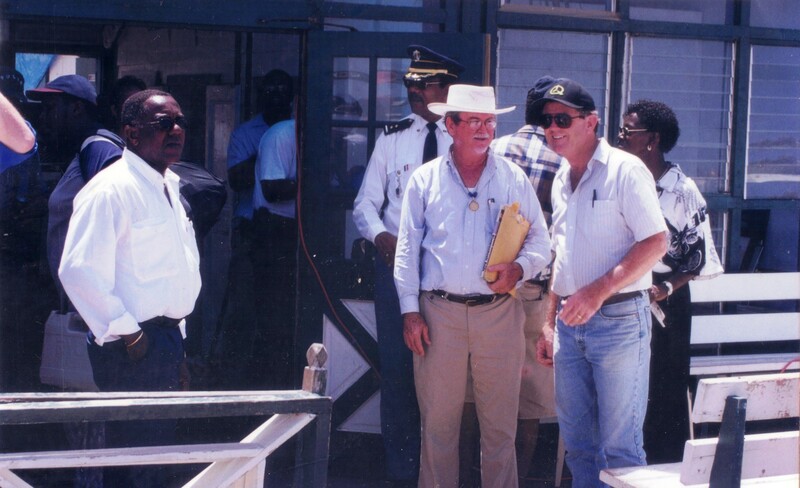 I did so well that a group came together on St. Maarten and formed the Windward Islands People’s Movement. Over the years the WIPM leadership changed hands. In 1983, I passed over to Mr. Vernon Hassell, then later came back as leader, then turned it over to Senator Ray Hassell, and the last years to Island Council Member Mr. Rolando Wilson. On behalf of the other members of the party I want to thank them for taking on the responsibility of Party Leader. Since November 1970 the WIPM party has always been represented on the Island Council and for the most part on the Executive Council as well. When we did lose in 1987 to Vernon Hassell’s party and in 1995 to Steve Hassell’s party both times it was because of a difference of opinion in the party and we tried not to look back on defeat but to look forward to victory. 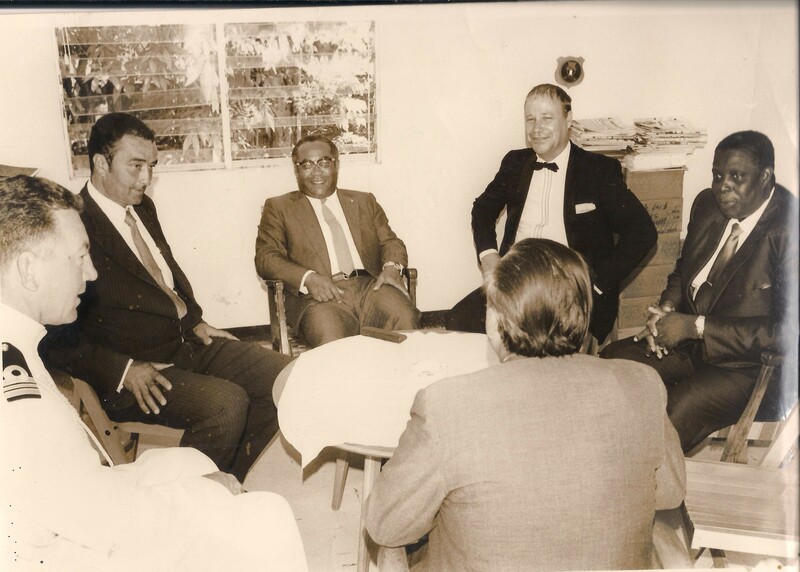 In the Central Government the WIPM has always represented Saba since 1981 when Mr. Max Nicholson was the Spokesman for Saba and I followed him in 1983. In 1986 together with Statia we appointed Mrs. Linda Badego Richardson followed by Mr. Ellis Woodley as Ministers of Education. 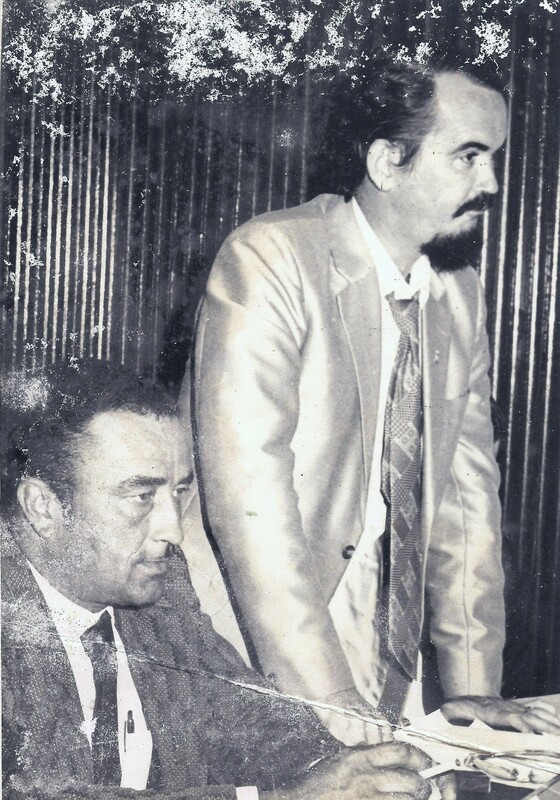 First WIPM Executive Council of Saba, 1971. After I was elected as Island Council Member and Commissioner I was forced out of the Council because it was claimed that both Lt. Governor Van Delden and I could not hold office at the same time. I still feel bitter about the troubles of those four years including being arrested twice and jailed twice all because of politics. From left to right. With back to camera Lt. Governor Van Delden, the Governor’s Adjutant, Commissioner Calvin Holm, Governor Ben Leito, Administrator Eugenius Johnson, and Commissioner/Act. Administrator John G. Woods. After that we had Mr. Max Nicholson in the Council of Ministers, as Junior Ministers, followed by Mr. Danny Hassell, who became a Minister later on, Mr. Roy Smith, Mr. Xavier Blackman, and Mrs. Amelia Nicholson. In Parliament it was I and Senator Ray Hassell from 1986 until 10-10-10. Each election the WIPM party scouts the community for good men and women who are willing to serve their island and we are doing the same again. Under the new system Saba will continue to need good leadership in the Island and in the Executive Council. The world is unstable, even Holland has been and still is in a very unstable political situation and so for them also the future is worrisome. 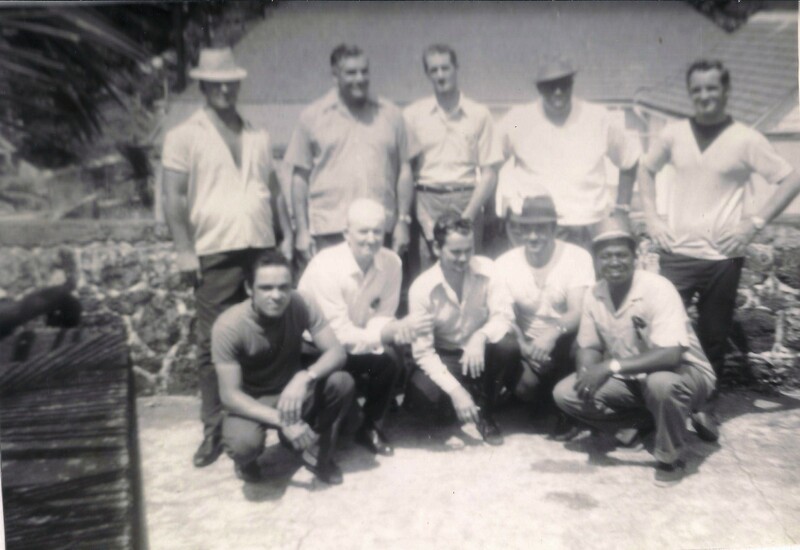 Left in picture Mr. Stevanist Heyliger who ran with WIPM in 1971 father of Island Council Member Eviton Heyliger (whose mother is from St. Vincent, a hard working group of people working on Saba and an asset to the community). To the right former Lt. Governor Sydney Sorton. Here on Saba we must always be on guard and continue to work hard, and to preserve our old traditions of agriculture, stock raising and fisheries. We can not depend on other people to grow our food. On the 40th anniversary of the WIPM party, we said: “There are so many people to thank today, people like Diana Medero, Louise (Weesie) Hassell, Benny Johnson, the late Mr. Elmer Linzey, Guy Hassell and Eugenius Johnson and so many others who were with me from the beginning and who had the same optimism that change would come to Saba. I always remember my brother Freddie and Carlyle Granger sitting in the Lido club being optimistic about every change, and always preaching “Man, Saba is going to change”, that was long before the airport, the harbour and the many other changes which came to the island in the last years. I was elected five times as Commissioner and served 16 years, as Commissioner, eight of which was with Cessie Granger who was then the oldest Commissioner and eight with Lisa Hassell who was then the youngest Commissioner. We had our differences of course but on the whole we enjoyed a good working relationship and I want to thank them as well. People like Alexander “Kaiser” Sorton, Hugo Levenstone, David Johnson, Calvin Holm, and many others who served with us on the Island Council, I thank them. ALL five in 1979 . From left to right: Will Johnson, Party Leader, Christian Alexander “Kaiser” Sorton, James Ray Hassell, Peter Lycester Granger, and David M. Johnson. I must also say thanks to the opposition. When things were down, people who had opposed me came to my rescue; people like Mr. William Carl Anslyn, a warrior in politics, people like Mr. Ishmael Levenstone and his son Dave have at times been on the WIPM list with me. In 1985 I remember when as number three candidate I pulled 301 votes. Diana and Harold were the last two to come in the voting booth just before they closed down and their two votes carried me over the top and set a record. The WIPM party is a member of the Social Christian Democratic Parties of Latin America since the late 1980’s. I and others from the party have been privileged to attend meetings all over Latin America with this group. Recently I was in El Salvador attending a meeting and before that Island Councilmember Carl Buncamper was in Panama. I remember once driving from the airport in Santiago Chile one of the loveliest cities in the world, and when I counted heads in the bus there were 7 ex Presidents with me from Venezuela, Panama, Haiti, and Costa Rica and so on in the same bus and I thought what a privilege it was coming from our little island Saba. July 2nd, 1975 Island Council of the Island Territory the Windward islands. I would also like to thank the present young Commissioners Bruce Zagers and Chris Johnson for taking on the difficult task of moving the island from a familiar position of the past into the new situation we are now in. It was no easy task and it will continue to be a challenge for the future. In 1972, I was at a low point in my life. I was sick at the year end and even when Eddie Buncamper came to pick me up to go out to bring in the New Year I felt so bad I had to decline. The so called “good life” had nearly brought me to my knees. On the stroke of midnight the radio station voice of St.Maarten changed hands and when my friend Vance James came on the first song he played for the New Year was “I can see clearly now”. I vowed then to change my life. In a few weeks I met my future wife Lynne and that has made all the difference to me in all my years of being in politics, and so I want to thank her and my children as well. And so I know that each of you who have served in public office will have your own reflections and will be thinking along the same line as I am thinking as you review your career in politics, and I want to thank you all, starting with our present leader Island Council Member Rolando Wilson going back all the way to November 1970 when with Granger and Woods the newly formed WIPM party entered the Island Council. I would also like to thank all those civil servants who faithfully assisted me and other WIPM officials. I see here this morning my two former secretaries and good friends Ms. Amorelle Granger and Mrs. Patsy Linzey and I want to thank them as well. Once again Father Dan, thanks for allowing me to speak to my people on this historic occasion. That was part of the speech made for the 40th anniversary of the party. As we move into the year of our 45th anniversary we will bring you news and views of the party which is largely responsible for bringing Saba to level of development where it is today. Ever forward never backward ,and in 2015 we are once again looking for your support to continue giving good Governance to our island. In 1995 the WIPM party lost the election because of a defection by Steve Hassell who said he could not work with Roy Smith both pictured here. In 1998 at Steve’s request when I stepped down as Senator I was appointed Act. Lt. Governor and ran his government for him until he left for the United States. What can he do now for you that he could not do back then? And as we move forward into the elections we will bring you more history of the party. Another section of The Saba Islander there will be news coming to you from The Old Lamplighter, where we will be putting fire under those who think they can get in government through a back door and expect that their names will not be called. Thanks once more for your continued support for the WIPM party. Sir Henry Morgan, famous pirate, and Governor of Jamaica. His two uncles, Edward (also his father-in-law) and Thomas, captured St. Eustatius and Saba in 1665 and drove out the Dutch. The title of this article is not invented by me to please those in the islands nowadays who would want to do just that. No! It is from the book by Anthony Gambrill “In search of the Buccaneers.” In my many books on the history of the buccaneers in the West Indies, I came across this book. Chapter 6 deals with St. Eustatius and Saba. I was already in the process of doing an article on the involvement of Sir Henry Morgan, and his two uncles Edward and Thomas, who were prominent in the history of our two islands with a major raid in 1665. Lieutenant.-Colonel Edward Morgan was the uncle and father-in-law of Sir Henry Morgan. In 1665 when war had been declared on Holland, the Governor of Jamaica issued commissions to several pirates and buccaneers to sail to and attack the Dutch islands of St. Eustatius, Saba, and Curacao.Edward Morgan was put in command of ten ships and some 500 men; most of them were “reformed prisoners, “while some were condemned pirates who had been pardoned in order to let them join the expedition. Before leaving Jamaica the crews mutinied, but were pacified by the promise of an equal share of all the spoils that should be taken. Three ships out of the fleet slipped away on the voyage, but the rest arrived at St. Eustatius, landed, and took the fort. Colonel Edward Morgan, who was an old and corpulent man, died of the heat and exertion during the campaign. He would have been buried on St. Eustatius at the time. The Statia Tourist Bureau can use this little historical fact by pointing out that Sir Henry Morgan’s uncle and father-in-law is buried on Statia. Edwards’s brother, Lieutenant.-Colonel Thomas Morgan sailed with his brother to attack Saba and St. Eustatius islands, and after these were surrendered by the Dutch, Thomas Morgan was left in charge. In 1666 he sailed in command of a company of buccaneers to assist Governor Wells, of St. Kitts, against the French. The defence of the island was disgraceful, and Morgan’s company was the only one which displayed any courage or discipline, and most of them were killed or wounded, Colonel Morgan himself being shot in both legs. Often these buccaneer leaders altered their titles from colonel to captain, to suit the particular enterprise on which they were engaged, according if it took place on sea or land. This information is gleaned from the book “The Pirates Who’s who”, by Philip Gosse. “The French temporarily occupied St. Eustatius or Statia as it is popularly known, in 1627 and erected a small fortification upon which the Dutch who later settled the island built Fort Orange in 1636. Once started the fort grew in importance, at first to provide security for the fledging colony of tobacco farmers but by the eighteenth century to protect the thriving trading port that lay beneath its battlements. However, at the time that Colonel Edward Morgan, supported by his buccaneers, led an assault on St. Eustatius; it provided a woefully inadequate defence. 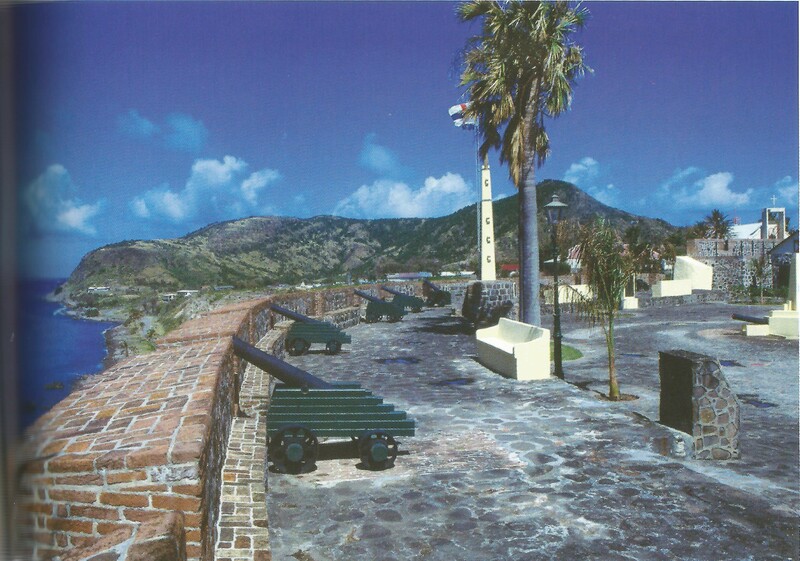 The famous Fort Orange on St. Eustatius from where Governor Johannes de Graaf fired the famous salute in recognition of the flag of the new republic to the North. The location of this fort goes back to when the island was first settled by the Dutch in 1636 and it is still well maintained and a great pride to the people of Statia. The English took nearly a decade after capturing Jamaica from the Spanish to realize that the Dutch were also a serious threat to their efforts to trade in the West Indies. It was Colonel Edward Morgan who was chosen to end that challenge. The Dutch had been present in the Caribbean region since the late sixteenth century. Deprived of access by the Portuguese to salt needed for pickling their herring catches, the Dutch crossed the Atlantic to the salt pans at Punta de Araya off Venezuela. 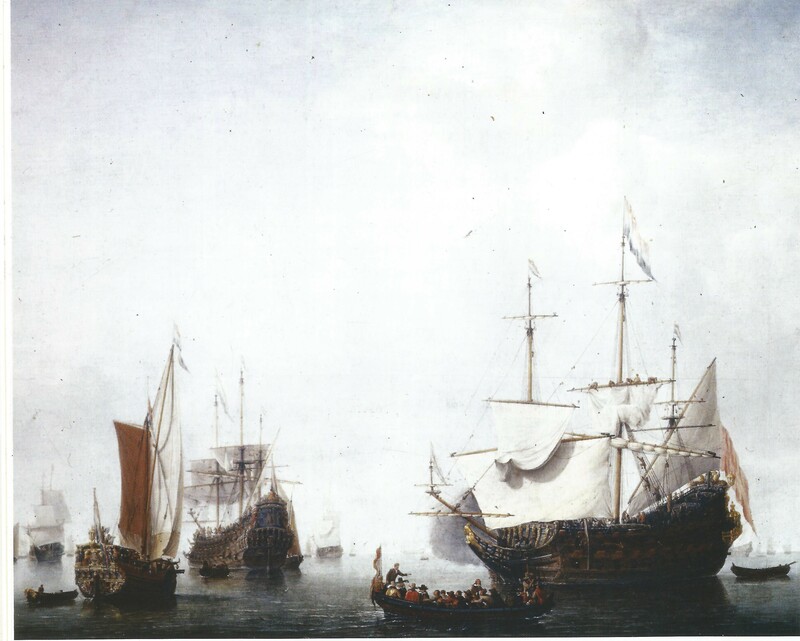 Dutch vessels were also selling supplies to Spanish settlements in the Eastern Caribbean despite Spain’s claim to the exclusive right to trading in the region. Their early incursions were dealt with harshly. 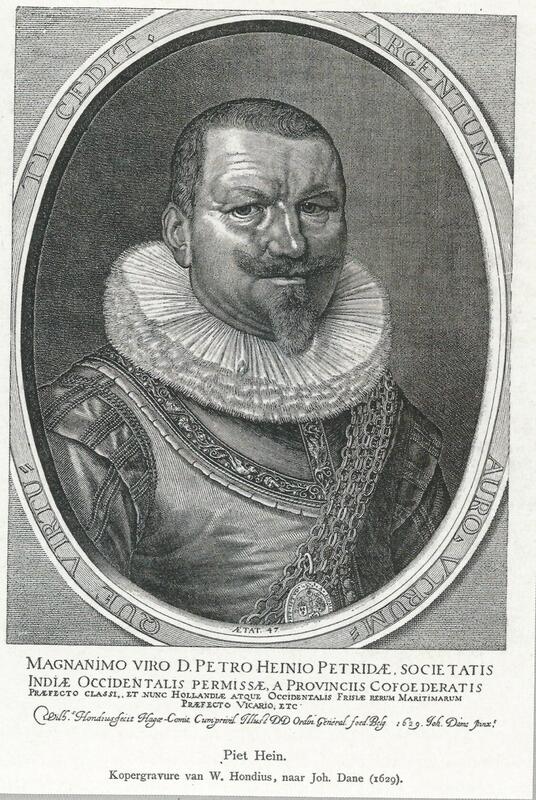 The Spaniard Luis Fajardo, with a fleet of 14 galleons and 2,500 men, attacked the interlopers, who included French and English, at Punta de Araya in 1605. He treated his captives as ‘pirates and corsairs’, beheading or hanging most of them without trial. When a 12 year truce between Spain and the Netherlands ended in 1621, the Dutch West India Company was formed by a group of 19 gentlemen known as the “Heeren XIX” with what has been described as “belligerent commerce” in mind. This company was early on enriched by Admiral Piet Heyn who captured the Spanish silver fleet in Matanzas Bay, Cuba, in September 1628. The story of this feat unequalled in his time is worth a story of its own but is not relevant for this article and there would not be enough space as well. Admiral Piet Heyn the most famous of the Dutch pirates who “captured” the Spanish Silver fleet in Matanzas Bay in Cuba and made whole set of people in Holland rich with that catch of his. The trade in salt continued to be a major attraction to the Dutch West India Company. Removing salt from seawater by collecting from pans in Bonaire, Tortuga (a Venezuelan island by that name) and St. Martin, frequently aroused Spain’s wrath and these islands were to change hands often. In 1634 the Dutch seized Curacao and its neighbouring islands. Realizing that Curacao possessed an excellent natural harbour, the Dutch made it their permanent trading post in the Caribbean. St. Eustatius was colonized in less dramatic fashion. 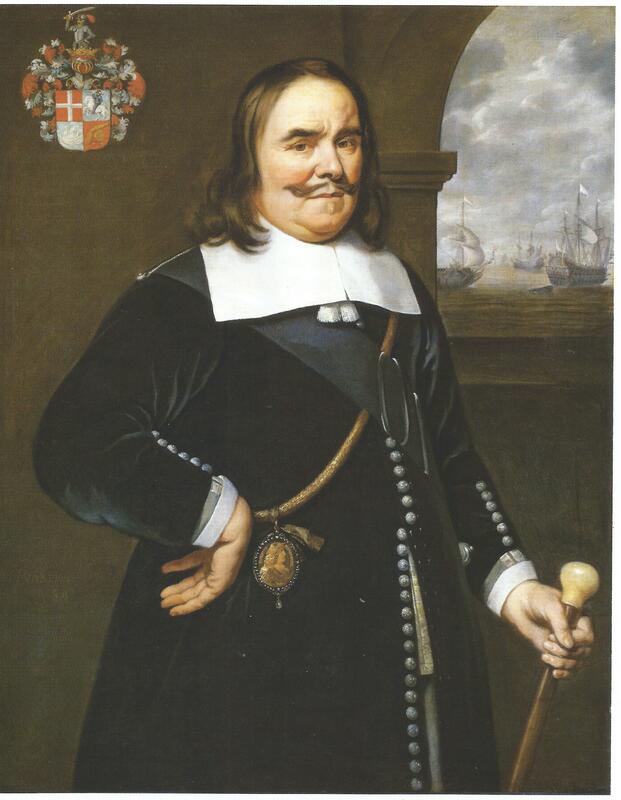 Jan Snouck, an entrepreneur from Flushing, got permission in 1636 from the Zeeland Chamber of Commerce to found a colony on any uninhabited West Indian island. The expedition’s first stop was St. Croix but discovering the English already entrenched. Peter Van Corselles, the leader who had already established a colony on Tobago, tried several other islands before disembarking at St. Eustatius with 50 settlers. He named it New Zeeland, not knowing that the indigenous Caribs themselves had called it Aloi which means cashew tree or St. Anastasia as Christopher Columbus had named it. In 1664 provost Marshall for Jamaica wrote about the privateers and their activities in the islands. These ‘desperate and numerous men’, called privateers by Lynch but were buccaneers by origin, were soon to be engaged in carrying out English policy in the Caribbean under the command of a military man who was father of Henry Morgan’s bride-to-be. Edward and his brother Thomas were professional mercenaries, officers serving in foreign armies at a time when their own countries were at peace. Both fought in the Netherlands and later in Germany. It was in Westphalia that Edward met and married Anna Petronilla, the daughter of Johan Ernst, Feiherr von Pollnitz, the governor of Lippstradt. The two brothers returned to England at the time of the Civil War but experienced very different fortunes. Eventually they both ended up in Jamaica. Colonel Edward Morgan was named Lt. Governor to Sir Modyford, not only as a reward for his loyalty to the King but apparently also because of his knowledge of the Dutch language and its military systems. The most respected Dutch admiral ever Michiel de Ruyter. He had just wreaked havoc on Barbados and some of the other British islands in the Eastern Caribbean and was headed back to Europe when Edward and Thomas Morgan captured St. Eustatius and Saba in 1665. De Ruyter had also been on St. Eustatius on that same voyage. And nowto the expedition itself to capture our islands the following:” Modyford meanwhile was planning an ambitious expedition to capture St. Eustatius, Saba and Curacao, then to drive out those Dutch trading at St. Kitts and finally on the homeward leg to challenge the buccaneers at Tortuga and mainland Hispaniola. The belated departure of the English expedition to St. Eustatius ultimately turned out to be fortuitous. In 1665 Admiral de Ruyter turned his attention to the West Indies hoping to take the English colonies by surprise. On May 17, 1665 he left the Caribbean altogether after attacking Barbados, Montserrat and Nevis. He had been anchored at St. Eustatius barely two months before the Jamaican fleet arrived. Meanwhile Colonel Edward Morgan must have had a premonition because he decided to write his will before setting off. Having had 40 years of military service meant he must have been at least in his late fifties. Once active in the field he was now overweight and unfit for the conditions of combat that fighting in the tropics imposed. In a memorandum to the governor he left his virtually virgin plantation to his two sons with the instruction that they should increase its size and value in order to be able to maintain their sisters and provide their dowries. His mortgaged London house and a claim he had on an estate in Wales were to pass to Mary Elizabeth, his eldest surviving daughter. Dutch warships under admirals like Heyn and de Ruyter wreaked havoc in the Caribbean during the middle of the seventeenth century. On April 16 Colonel Morgan sailed to the Isle of Pines off Cuba where he was joined by buccaneers who provided his mercenary force. As Governor Modyford put it: “They are chiefly reformed pirates, scarce a planter among them, being resolute fellows, and well armed with fuses and pistols.’ Amongst the captains of the nine vessels were two already of some repute: Captain Robert Searle. Another of Colonel Morgan’s men was the energetic Captain Maurice Williams whose vessel, “Speaker”, was to be the flagship. When the force mustered on May 16, Morgan had nine ships, 71 guns and 450 men. After the surrender an inventory was taken: 20 cannon, 131 small arms, six barrels of powder, 300 head of cattle, 50 horses, 300 sheep and goats, five ships, 840 African slaves and Indians and fifty thousand pounds of cotton. They found six plantations on the island possessing sugar works and cotton fields. 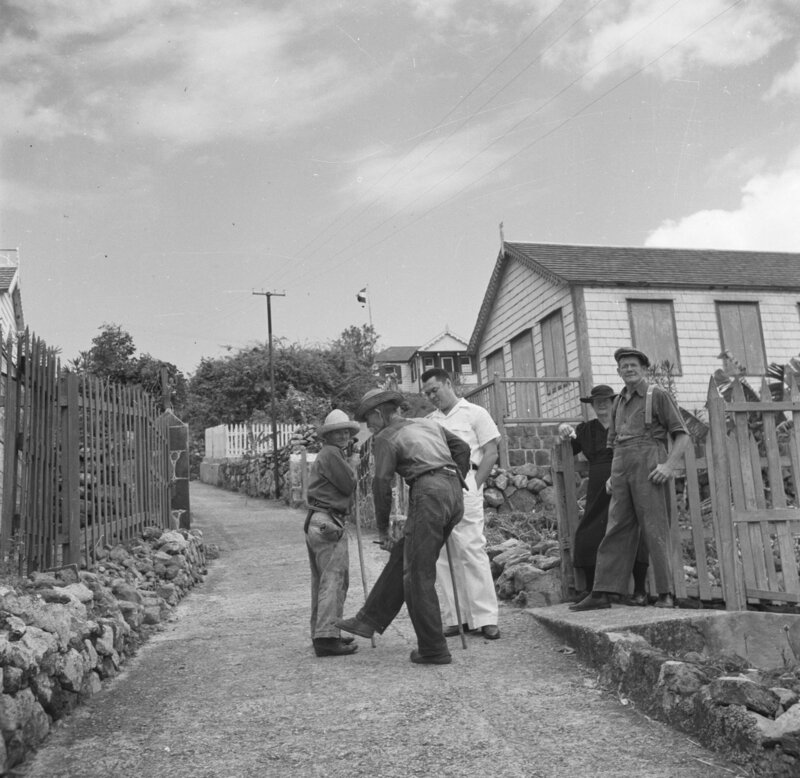 Of the settlers, 76 men, 42 women, and 132 children-all Dutch-were deported to St. Martin. Another 80, including English, Irish and Dutch who took an oath of allegiance to King Charles II were allowed to remain on the island. The island was renamed New Dunkirk. The approach to Saba by boat has remained the same since the pirate Thomas Morgan and his crew were sent from St. Eustatius to capture Saba in 1665. Where he died was not recorded but it may well have been traversing the steep track leading from the water’s edge to the fort above. By general consensus Colonel Carey assumed command, and later when a Major Stevens arrived on the Mayflower, which was thought to have been lost in the storm, he was directed to take the nearby island of Saba. Even smaller than St. Eustatius, Saba consisted of the core of another extinct volcano rising 3000 feet out of the sea with a little arable land on its sides and in the cone. Here a small quantity of arms, cattle and other goods was seized along with 85 African slaves and Indians. Eighty seven Dutch were sent to St. Martin; 64 heads of households, English, Irish and French took the royal oath, together with their wives and children the total was 226 left behind, including two Dutch families consisting of ten people who swore allegiance to the British King. Two Indian families were also left behind. 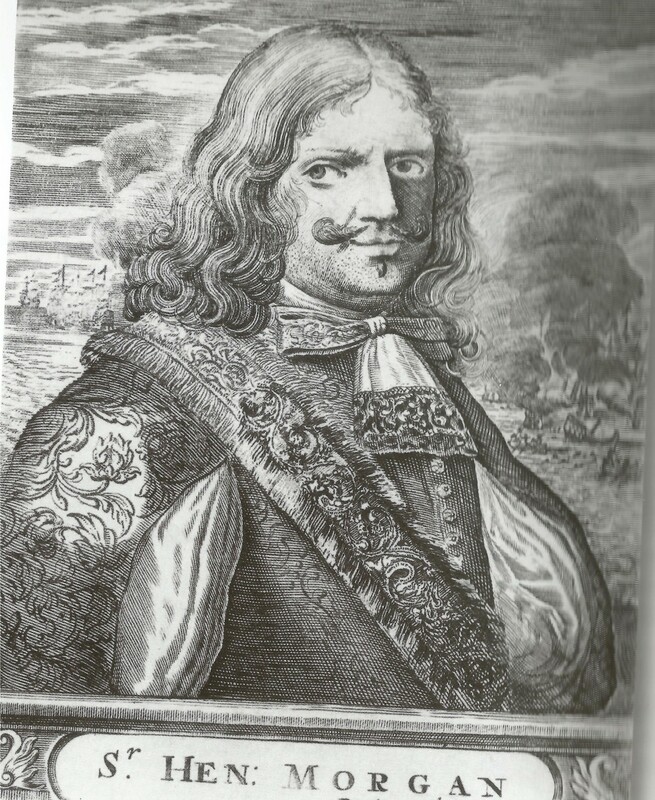 Having incited the buccaneers to capture Saba, Colonel Carey was unable to persuade them to continue on to Curacao, their ‘purchase’ having been so disappointing compared with the booty they were used to confiscating from the Spanish. Despite this, the governor of Jamaica wrote home to the colonial authorities that he expected the name of the Dutch would be forgotten in a matter of months in the West Indies. They turned out to be hardier than he anticipated and in 2014 they are still in the West Indies with Surinam even having Dutch as their national language. Leaving Colonel Thomas Morgan and a small contingent behind to occupy St. Eustatius and Saba, most of the buccaneers as well as Colonel Carey returned to Jamaica. Modyford was to report that 500 slaves had arrived in Jamaica along with cannons and other armaments, sugar, coppers, stills and sundry goods. As a postscript to his report Modyford said of Colonel Morgan ‘… I fear I shall never meet with one so useful, so complacent and loving as Colonel Morgan was: he died very poor, his great family having little to support them; his eldest daughter is since married to Sergeant-Major Bindlosse of good estate.’ His daughter Anna married Robert Byndloss commandant of the garrison at Fort Charles after the customary three months of mourning for her father. The surviving eldest daughter Mary Elizabeth married her cousin Henry Morgan not long after and a third sister, Johanna Wilhelmina, too young at the time was later to marry Henry Archbould. The three men, Byndloss, Morgan and Archbould were in different ways to play significant roles in moulding the future of Port Royal and Jamaica. Saba remained in the hands of the British and to the population was added some 90 pirates who saw in Saba a good place from which to hide out and pursue their pirate activities from here. It was only in 1680 that it was remembered that the island had been Dutch and subsequently it was returned to the Dutch only to be recaptured some years later. Saba changed hands 12 times. As well as the French, three other European powers were to claim ownership of the island of St. Eustatius a total of 22 different times before it was ultimately returned to Dutch hands in 1816. Driving out the Dutch as seen here is no easy task, for those like the English who underestimated the tenacity of the Dutch all the way back in 1665! In former times bands like these would play Christmas Carols and West Indian Christmas songs throughout the villages on Saba. Here were have Volney Hassell aka “Bungee” with his self made drum. Blind from birth he could do everything. 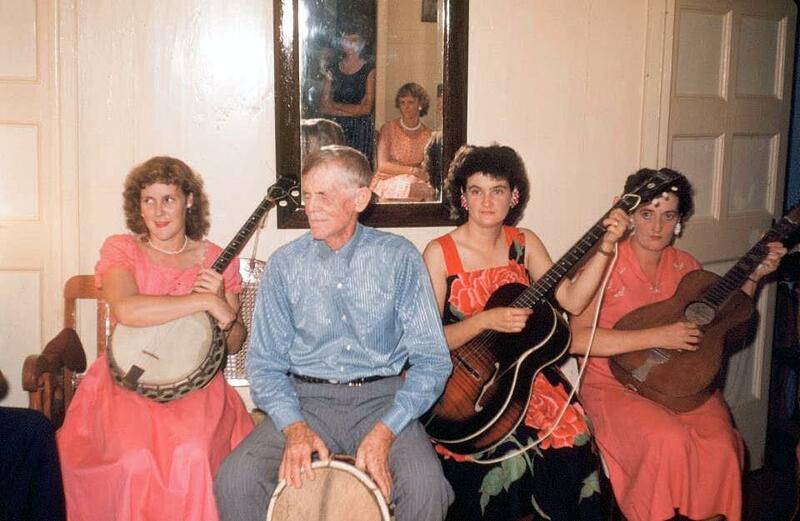 To his left with the banjo. Aileen Johnson, and to the right is Aggie Peterson and Melanie Johnson. Reflected in the mirror cousins Jean and Heather Every. 1960’s. When I told the ladies at the cash registers at the supermarket at Maho that I was going away for a month, they exclaimed; “But what is going to happen to the “Sea Grape Tree” when you are away? Mind don’t you let the “Sea Grape Tree” dry up. I promised them that I would try and take care of the “Sea Grape Tree” even while I was away. 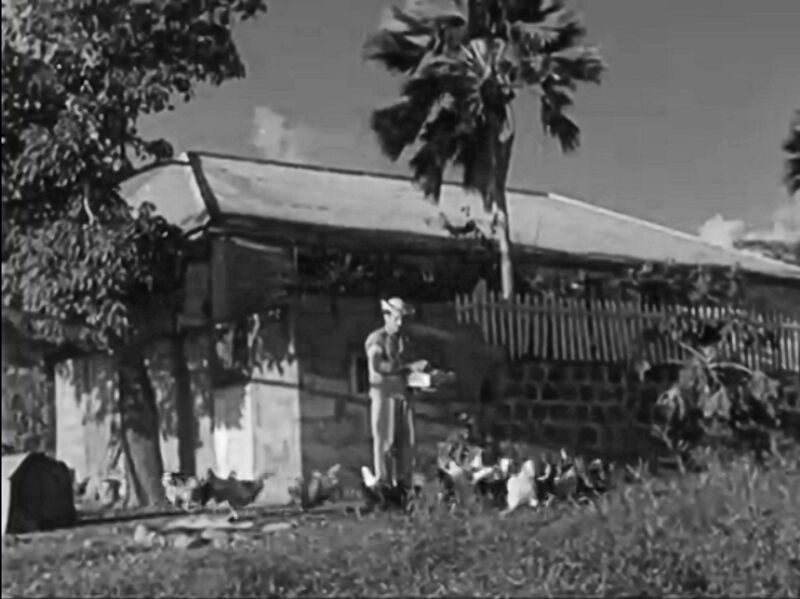 William Carl Anslyn when he owned the Schotsenhoek plantation on the island of St. Eustatius picture here feed ing his “yard fowls”. One of the many lovely Saban owned schooners of former times. This one is the “Mona Marie” whose captain was Laurie Hassell, already captain at the age of 19. His father Capt. William Benjamin Hassell was the owner of this and many more schooners. That glory period in Saba’s history though now passed must never be forgotten!! Miss Lily Every here sitting at the entrance to the path to her home located behind “Miss Marguerite Hassell’s house at “Under the Hill” in the Windwardside. Miss Johanna Every, sister of Lily. 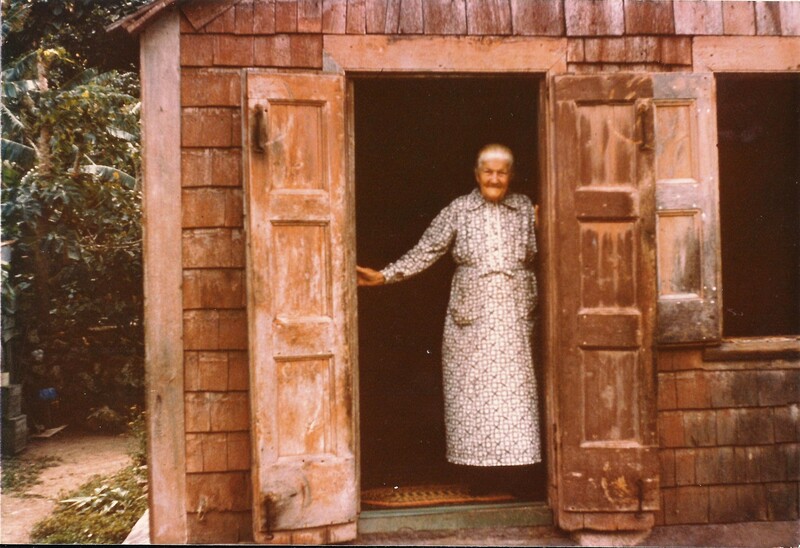 Miss Esther “Hettie” Peterson at her little home in Windwardside. She lived to be just a few months short of 104. When I was a boy, if anything had changed it was not much different than in my grandparents’ time. My great-grandfather had the choice once a year, after being forced to clean the public road, to choose between five cents in cash or the equivalent in rum or tobacco. The rest of the year he was on his own. My grandfather James Horton Simmons used to get sixty-five cents a day. He had a flock of daughters to boot which was considered a disaster in those days. Girls could not help you farm or fish of course. When his cow fell to her death over the cliff at Hell’s Gate, “Horton” declared that it would have been better that he had lost his wife as he could get another one of those, but where was he to get another cow. Life was hard back then. Father Meesters, Roman Catholic Priest. 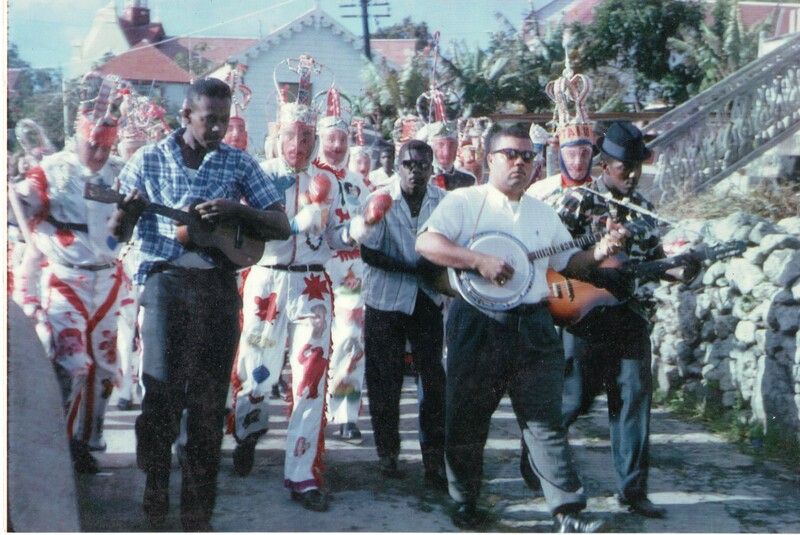 Boxing Day or second day Christmas on Saba the men would get dressed up and go with the Occasionals Band led by Carlyle Granger from house to house, drinking, dancing and having a good time. This was a tradition mostly on Windwardside and Hell’s Gate. 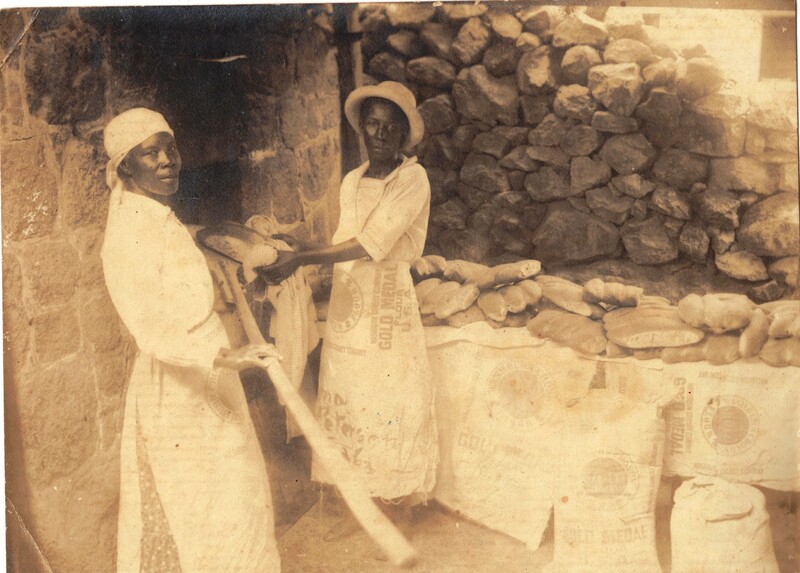 Miss Helena Peterson-Every’s bakery in Windwardside here with Agnes Maxwell left and Louvenia Hassell right. Around Christmas it was time for sweet potato pudding, banana pies, coconut tarts and many other delicious treats from the bakery and in private homes. 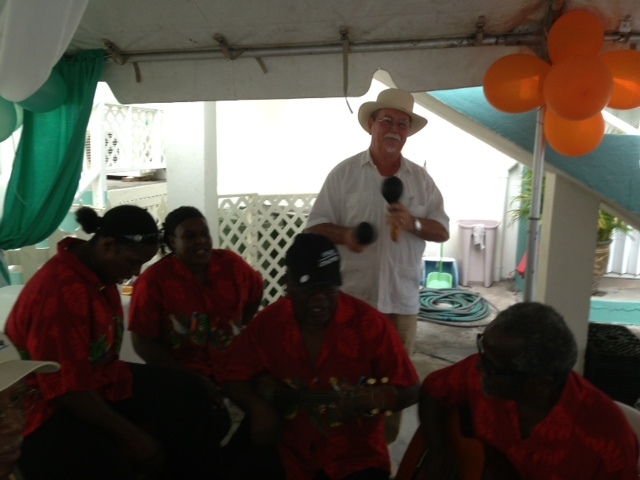 Here I am playing the Maracas with the “Killy-Killy” band on the island of St. Eustatius. Happy 2014 Holidays to all. Happy Christmas to all and May the New Year be a blessed one for all of our people. Although the original of this was written back in 2008 it is still relevant for the international readers of “The Saba Islander”. Enjoy! And since I have not used Latin since my days as an altar boy, if anyone can translate the Latin advice given to me these many years ago by Father Meesters please translate and send me a copy! Recordar es Vivir!! 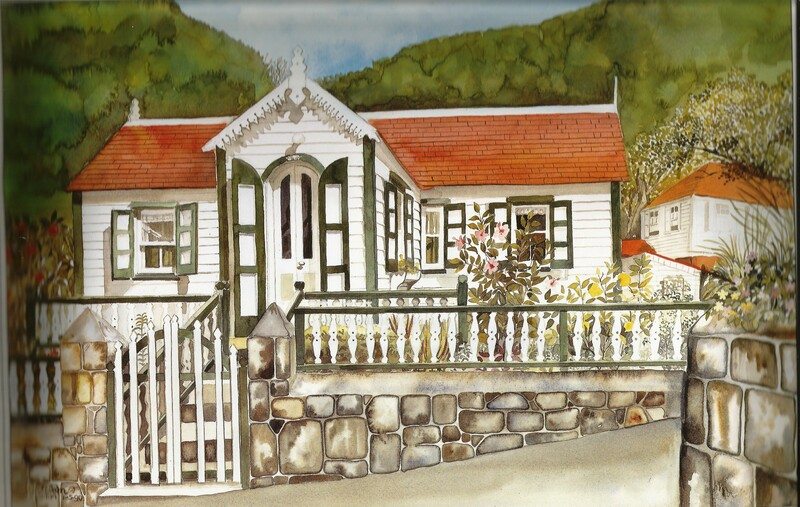 Miss Marguerite’s House from a painting by Heleen Cornet and on the cover of her book Saban Cottages. First owned by Mr. Bloomfield Hassell and probably built around 1907 or so. This lovely home known to all nowadays as “Miss Marguerites House” was built by Mr. Bloomfield Hassell a prominent merchant in his day. In probably the first photo taken of this part of Windwardside between 1870 and 1875 the lot was vacant but the still existing cistern is pictured. There may have been a house before that photo was taken. A mulatto family related to the Every/Peterson families lived in the now vacant lot between this house and the Museum. Miss Lily Every neighbour of Miss Marguerite. Miss Johanna Every. She and her sister Lily and Merselita together with their mother lived just behind Miss Marguerites House. 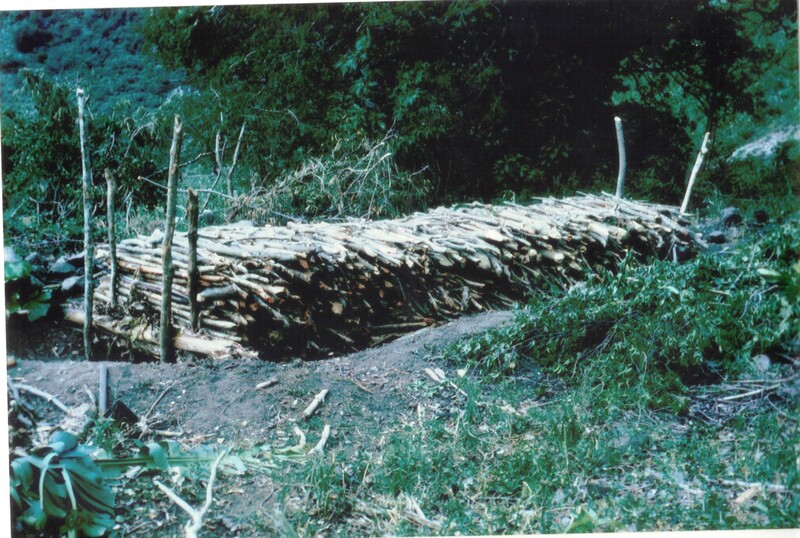 There were three small slave huts there and they can be seen in the photo referred to here. Mr. Bloomfield Hassell in suspenders with his sister Mara standing in the gate leading to his grocery store, while Dr. J.M.J. Chocolaad is testing the health of his people Waldron Hassell (above) and John Peter Hassell (below). 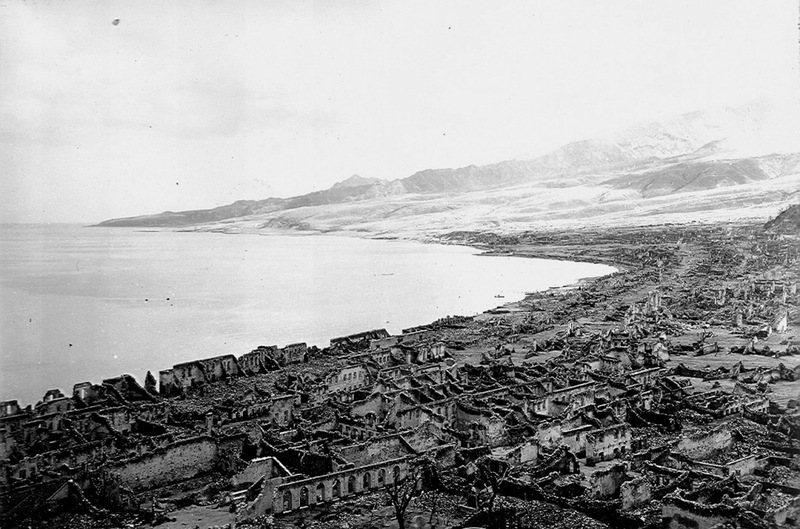 Photo from 1947. Mr. Bloomfield Hassell also owned across the street from his home where the conference room of Juliana’s Hotel is now located. When Mr Bloomfield Hassell died, that property was sold to Mr. Joseph “Mano” Emanuel Vlaun who employed Mr. Arthur Chester Hassell to manage this store for him. Mr. Bloomfield Hassell was born on July 11th, 1878 and died at the age of 74 on August 28th 1952. His parents were Henry Bloomfield Hassell and Rose Ellen Holm. He was married to Ethel Hassell who died on Saba on May 15th, 1943 at the age of 58. Her parents were Lovelock Hassell and Agnes Holm. 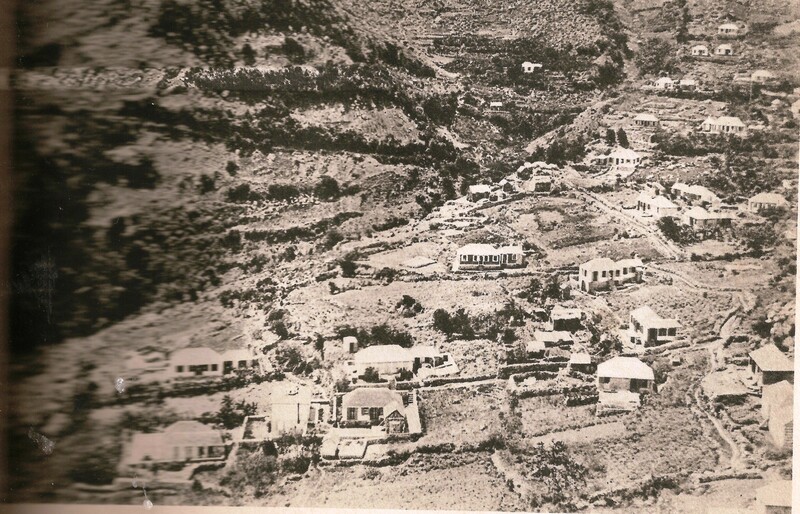 Photo of “Under-the-Hill” in Windwardside taken between 1870 and 1875, before the Anglican church was built (1876-77) and before Mr. Bloomfield Hassell built his house. They were cousins and were married on Tuesday May 19th, 1908. The schooner “Esther Anita” parked up at the South Street sea port. This was just one of the many fine Saban owned schooners which traded with New York from the Eastern Caribbean islands and Barbados and St. Thomas. This one belonged to Capt. 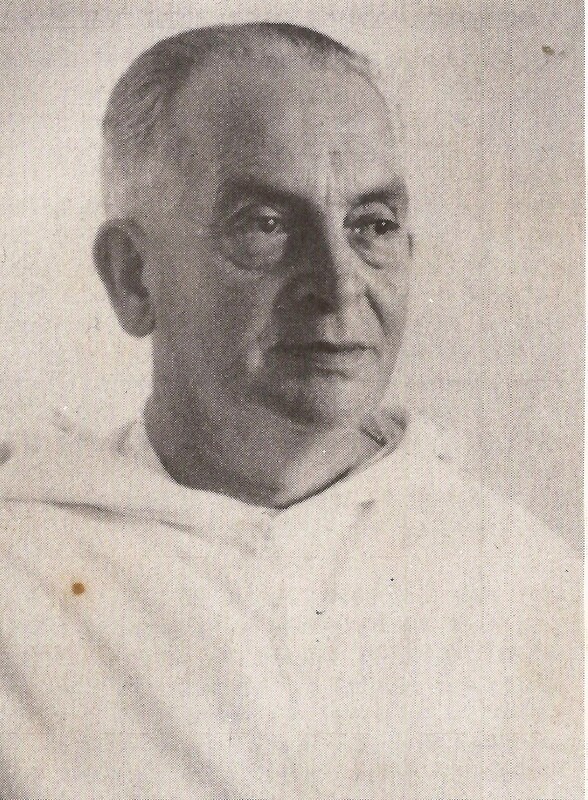 William Benjamin Hassell grandfather of the Goddard family on Barbados. 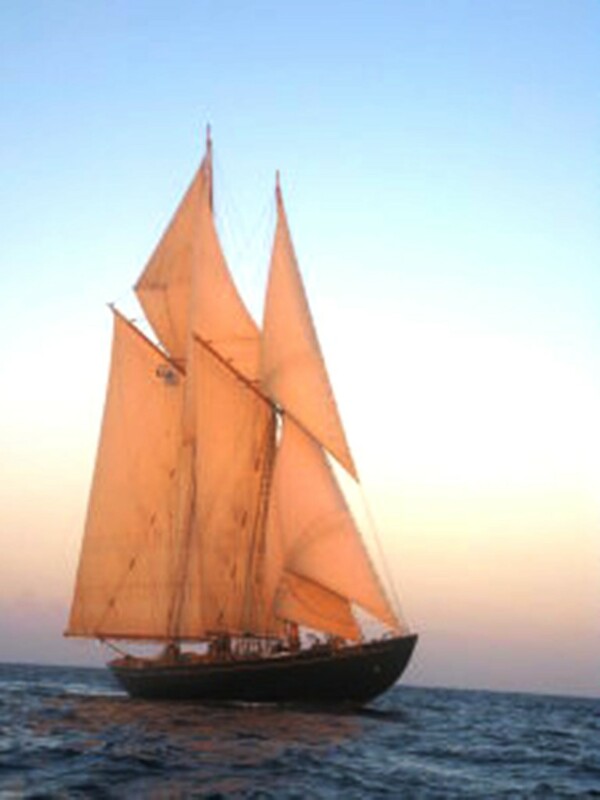 The schooner made it once in nine days from New York to Saba. Lumber, shingles and everything needed to build the lovely Saba cottages were brought from New York to Saba by these schooners. In those days it was customary to visit the home of the bride to be while engaged and to be engaged in building a new home for the bride to be. So it is reasonable to assume that the house was built and completed no later than 1908. Further research in the Registry of Properties will be able to shed more light on this matter as to when the property was acquired by Mr “Bloomy” as he was known. That style house would have been built with hand tools only in a period of six weeks for $140.—by a Master carpenter and at most two helpers. 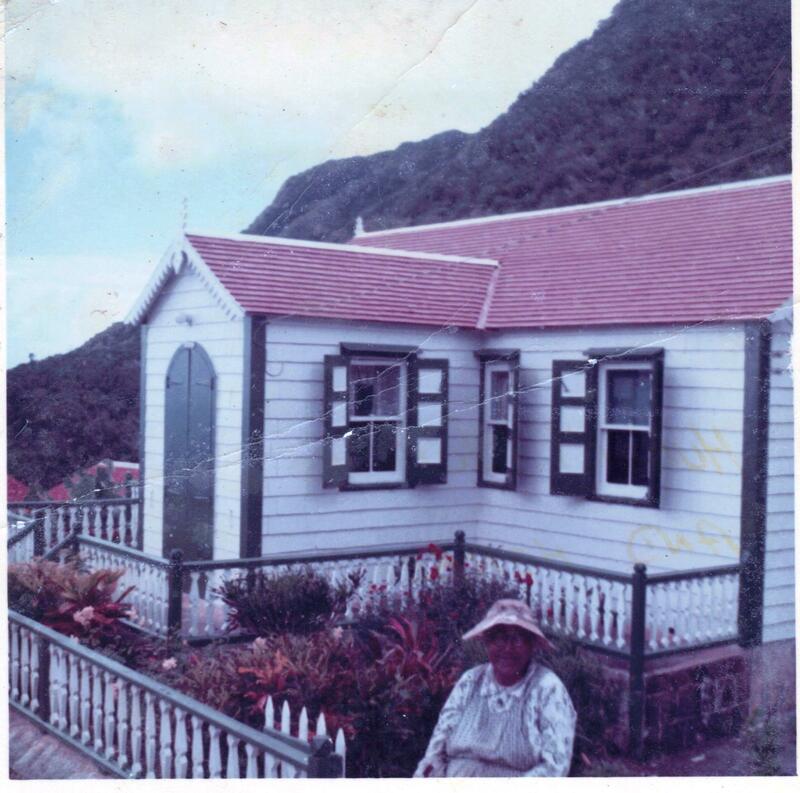 In Windwardside there were some famous Master carpenters who also built some of the former lovely homes on the Front Street in Philipsburg, St. Martin. Among the best were “Bo Willie” Leverock and his son Cyrillus, also Alphonsius “Connor” Hassell and a number of others. The wood would have been imported from New York to which port Saban owned schooners called on a monthly basis back then. There were times that as many as three large Saban schooners would be docked at pier 17 at South Street Seaport. They would carry sugar from St. Kitts, salt from either St. Martin or Anguilla and passengers from the Eastern Caribbean. They would also trade between Barbados and New York. The return trip they would bring back general merchandize, lumber, shingles, and passengers. His wife died in 1943 on May 15th at the age of 58 and he passed away on Thursday August 28th 1952. Shortly after his death the grocery store and surrounding land was sold to Mr. Joseph Emanuel Vlaun. The home was first sold to Mr John Joseph Simmons and his wife Lillian Hassell (parents of Lloyd and Harry Simmons, among others) after Mr Bloomy died. When Mr Simmons was about to retire from the ESSO oil refinery on Aruba another house on the way to “Booby Hill” became available and Mr Simmons bought that house from Mr Johnny Hassell. Mr Bloomy’s House was then sold to Miss Marguerite Hassell whose parent’s home was and still is located above this home. That would have been around 1959 or so. I remember Miss Marguerite living in her new home in early 1962 as she and I worked for a while together in the Post Office in Windwardside. She lived there for the rest of her life with the only exception when she would visit her brother Norman and his family in the United States. And so the house became known as Miss Marguerite’s House. Miss Marguerite Hassell born May 6th, 1919 and died September 9th, 2011. She was Postmistress, Recorder for Island Council meetings and was known for her fine Saba Lace known as “Spanish Work”. She and her maid Miss Helen van Putten kept her lovely home in prime condition. 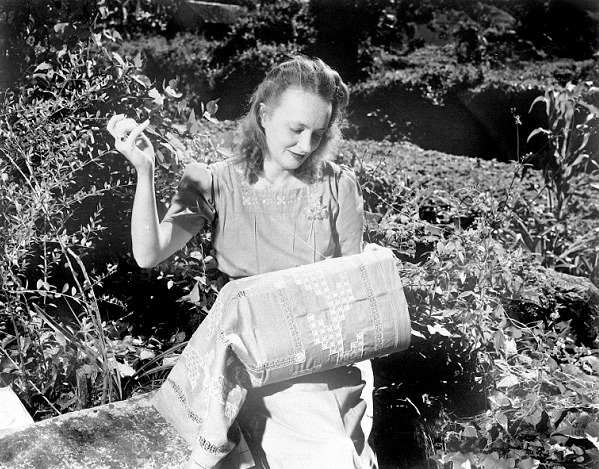 Miss Maugerite (spelled this way) was born on May 6th, 1919 and passed away on September 9th, 2011. At her funeral I did a eulogy on her life which is attached to this brief history of this house. Miss Maugerite took loving care of this beautiful home and was assisted by Miss Helen van Putten who was her housekeeper most of her life. And so it is no wonder that the house is universally known now as: “Miss Marguerite’s House”! I remind people that the reason why Saba has not yet been over developed is because of our limitations. Our limitations are our best assets. Because we have no white sand beaches, or a large airport or harbour, we have been saved from over development. 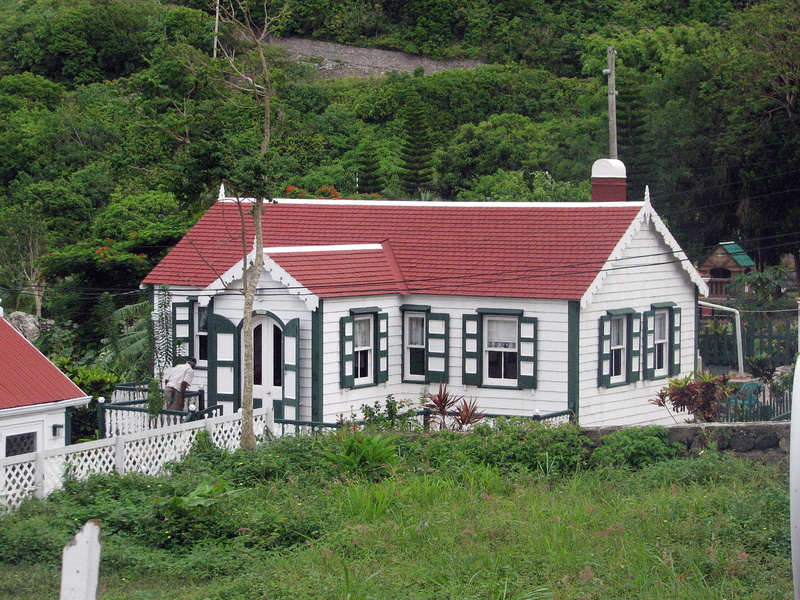 Among our best assets which draw visitors to Saba are our well kept Saban houses painted in their traditional colours with red roofs, white sides and green or red and white shutters, and a number of them with ovens and chimneys. Move away from that and one of our best assets will be lost. We encourage the stranger whom we have welcomed into our island to respect our traditions and our culture and they too will benefit by it. Miss Marguerites House is a prime example of over one hundred years of cherishing and maintaining our Saban building culture. And so we hope that if one should come back to Saba five hundred years from now that if not all some of these lovely homes will still be here to be admired by all visitors as well as natives.! Another great photo of Miss Marguerite’s House with the painter James Anthony Simmons doing some painting on the house. 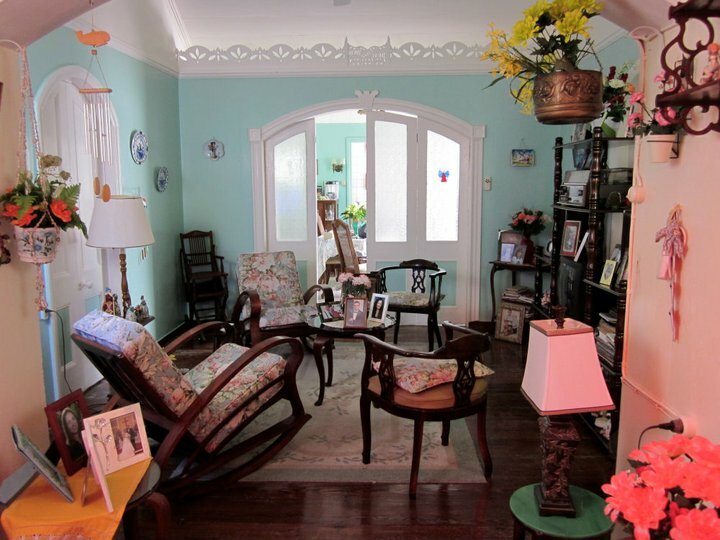 The living room of Miss Marguerite’s House when she lived there. 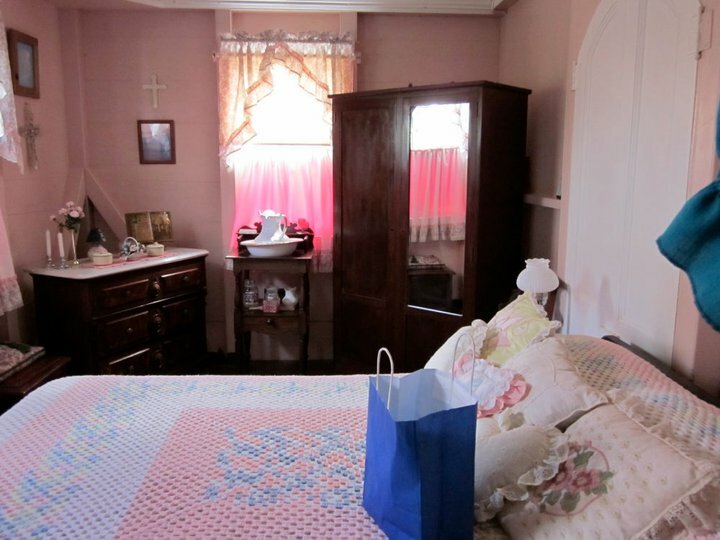 One of the bedrooms in Miss Marguerite’s House. Flossie’s two uncles. 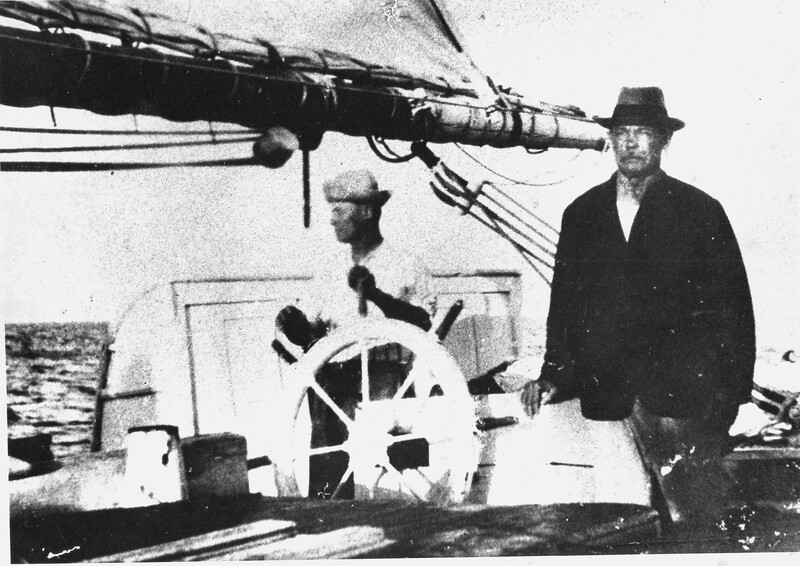 Captain John Thomas Hassell at the wheel of one of his schooners the “Maisie Hassell” and his brother Capt. William Benjamin Hassell owner of many schooners and grandfather of the Goddard family on Barbados. The person after whom this house was named was Flossie Hassell who was born on Sunday June 30th 1901. Her parents were John George Hassell born 1865 and Inez Elizabeth Every born 1870. Her father’s brothers were all seafarers Capt. William Benjamin “Capt. Ben” who is the grandfather of the famous Goddard family of Barbados, Capt. Abraham who bought and sold schooners to the West Indies from the East Coast of the United States, Capt. John Thomas Hassell, who owned famous schooners like the “Maisie” and Mr. Carl who sailed with his brothers but who later had a grocery store where the restaurant the “Swinging Doors” is now located. Mr. Carl Hassell’s life story and that of his family is also recorded in the book “Saba Silhouettes” and is a very interesting read as well. 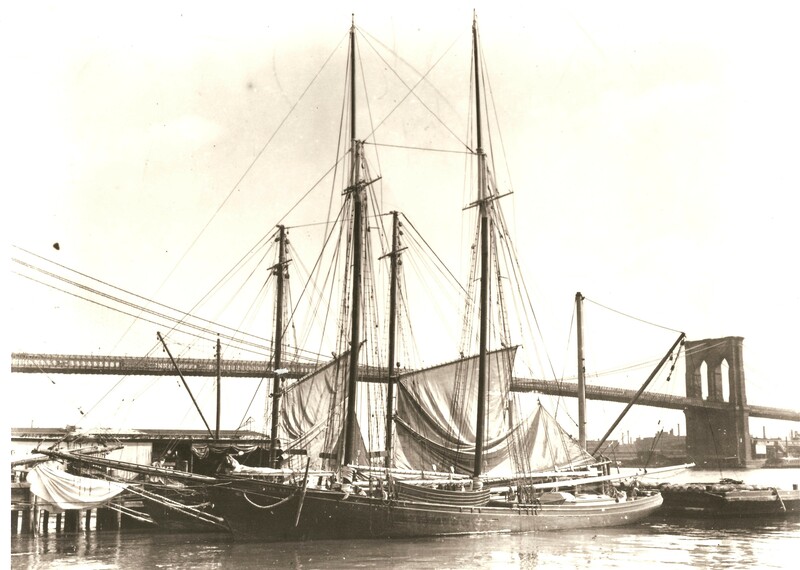 Flossie’s father “johnny Hassell” was a cook on a large American schooner which was destroyed on May 8th, 1902 when Mount Pele erupted and destroyed not only the lovely city of St. Pierre but also those ships which remained in the harbour so Flossie never knew her father. Her mother survived until the age of 83 and died on June 20th, 1951. She had three other siblings one named Ruby who was born on October 28th, 1898 who later emigrated to the United States and after having a son she died of pneumonia. 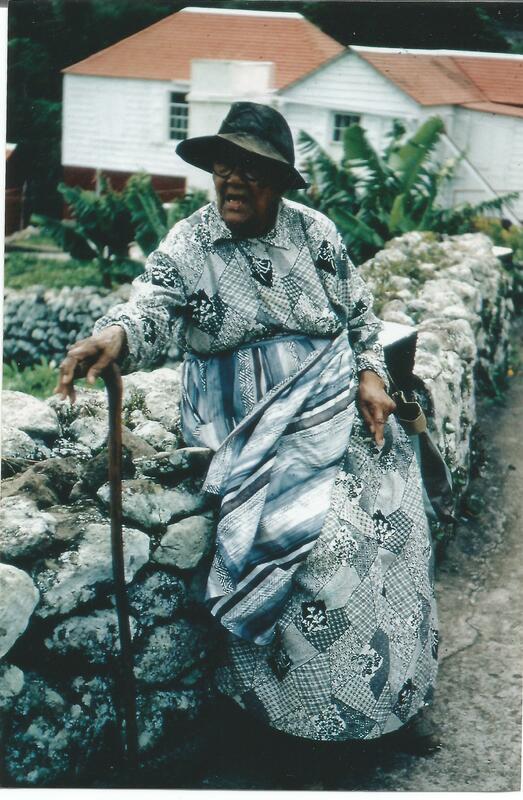 Another sister Elva who was born on September 20th, 1896 but because of the trauma of the loss of her father and the hardships which followed she was committed to a mental institute on Curacao and died there. And then Volney (also spelled Valney) who was born blind on Sunday October 14th, 1894 and had to survive from farming the land. Flossie lived a quiet hardworking life doing her Saba lace work or “Spanish Work” which when Ruby was alive would be sent to her to try and sell in the United States while she was still alive. Afterwards she had correspondence friends who would try and help her out with selling her fine thread work. Later on when tourists started coming to Saba she would sell to them as well. 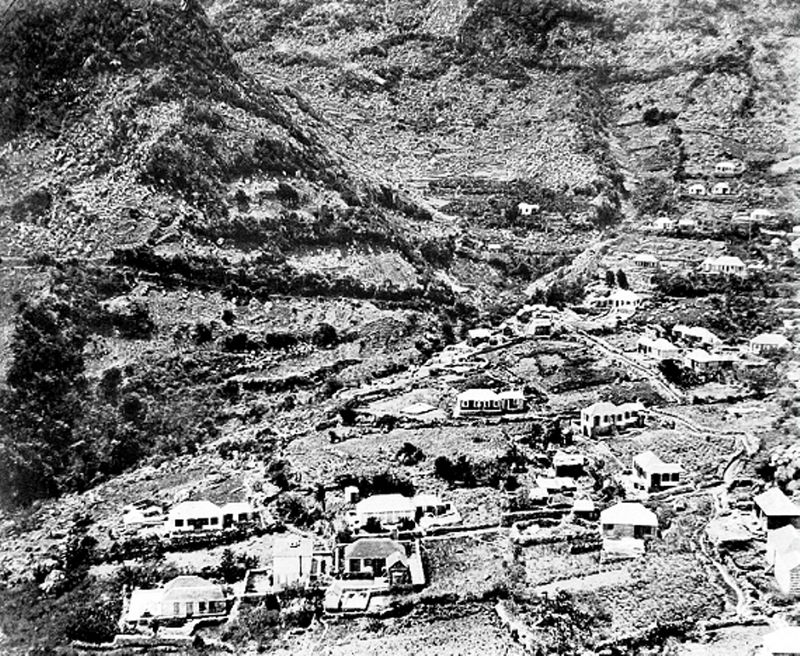 Picture of Under-the-Hill in Windwardside taken between 1870 and 1875. Her brother Volney aka “Bungie” had a long interview with Dr. Julian Gorham Crane in her book “Saba Silhouettes” from which we will quote for this short history of the house. The earliest known photo of this area known as “Under-the-Hill” is from around 1870 to 1875. Flossie’s cottage does not appear in that photo but there is another older house to the West of Flossie’s cottage. Traditionally on Saba when couples were getting married the groom would build a house before the wedding. Flossie’s parents got married on Wednesday January 7th 1894 and so the house would have been built around 1893. Harbour traffic at the lovely city of St. Pierre Martinique. On May 8th, 1902 Mount Pele in the background erupted and killed John George Hassell and forty thousand other people. He may have very well been on one of these schooners pictured here. 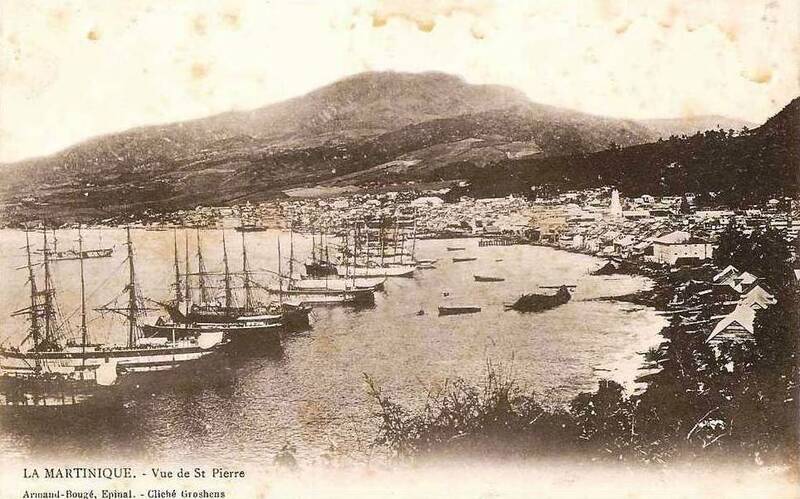 This is what was left of the lovely and liveliest city of the West Indies, St. Pierre on the island of Martinique after Mt. Pelé erupted on May 8th 1902. Volney Hassell blind from birth here playing his drum which he made himself. To his left on the banjo Aileen Johnson and to his right Aggie Peterson and Melanie Johnson on the guitars. In the mirror reflection Heather and Jean Every. In” Saba Silhouettes” Volney aka “Bungie” goes on to tell us how life was for him and his family. Making Panama hats from scratch, planting, how to make a drum, and all sorts of interesting stories. One must remember that he was blind from birth and survived from farming. He explains all of that too in his interview. Since no one makes drums anymore I will end with “Bungie” telling us how to make a drum. “And then we turned to then to make the drums, ye see. I’ve had so many now that I can’t tell you how many. I’m going to tell you now, the very first one that I had I might’ve been about eight to ten years . Right. Just about that. Well, and then we’d roll on from then, accordin’ to the saying. I never made my first one; a colored fella made it for me, but it wasn’t made so good as the one that I got now. Well, I’m goin’ tell you now, all right. Well now, ye see, we always looks for it to have a thin skin, ye know. They claim that it sounds the best. “We can make ‘em out of the sheepskin and the goatskin too, ye see; but I don’t eat no sheep and I can’t handle it. I can’t make up my mind to handle the sheepskin, ye know. So all right then, we dries the skin. I makes mine out of the goat’s skin, but not out of the sheep. They claims the sheepskin sounds the best, but I can’t, I can’t make it up in my mind to do it. You see, we nail them up to the side of the house; we spread them out so that the skin don’t wrinkle ye see. Well then, after the skin is dry, we takes it then with our knife and we scrapes it. We bores the holes, ye see, into the keg, a nail keg. What the nails comes into. Mine is the best, Well, I’ll tell you, it all depends on the quality of the wood, ye know. This of mine is a heavy wood, and James and theirs is more lighter like, a herring keg. Well now, all right. So the skin is scraped, so we’s goin’ to put the skin on today. We takes it and we puts it down in water and soaks it – sometimes they stinks too! Then we soaks it down good, you know, till it comes dead slap, and then we spreads it o’er the keg. And then a couple o’ we, we pulls it down tight. And so thanks to “Bungy” blind from birth we know how to make a drum. He and his sister Flossie lived in the house until they died. Jeep coming up from Captains Quarters Hotel. To the left is Flossie’s cottage and to the right is Miss Marguerite’s cottage.